So today's APOD is an RGB + Hα image. The picture is striking indeed, and the nebula seems to be unfolding and unfolding like a lightyear-sized rose. The Lagoon Nebula also looks exceedingly red in today's APOD. 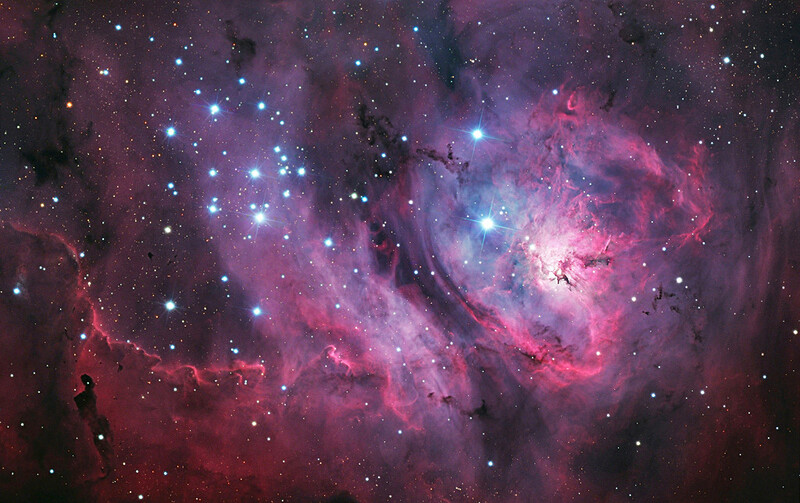 The Lagoon Nebula is red, of course. It is strongly dominated by Hα emission, which is certainly red in color. The problem for me is that this emphasis on Hα emission makes the stars look so insignificant, as they are drowned out by the deluge of redness. László Francsics / Royal Museums Greenwich. I'm reminded of something I read very long ago, when the Hubble Telescope was brand new, and astronomers were taking "test pictures" in order to calibrate the HST. So they wanted to photograph a nebula in, I think, the Large Magellanic Cloud. (It was not the Tarantula nebula.) The astronomers were shocked to see that the picture they had taken showed only stars, and no nebulosity at all! But then they realized that starlight is usually so much stronger than nebular light, and they had not used the right filters to capture the nebula. The picture at right joined the Insight Astronomy Photographer of the Year in 2015. I find it stunningly beautiful, and superior in many ways to today's APOD. There must be many reasons for the superior quality of László Francsics' image, but one of them, I think, is the superb treatment of color. A period (".") was missed at the end of Hydrogen -- just before "Star formation". This typo has now been corrected on the main NASA APOD. We apologize for the omission. A period (".") was missed at the end of Hydrogen -- just before "Star formation". on account of: The Lagoon Nebula is an H II region.